Eli at Left i on the news, writes this morning about the financial cost of the Global War On Terror™. He considers the difference that our "defense" spending would have made to the lives of the 5.6 million children who die each year from malnutrition-related causes, had it been directed instead to humanitarian ends. (To say nothing of those who die rather more directly from our war budget, i.e. by our bombing or shooting them). Coincidentally, I also came across this morning an online Cost Of War Calculator (via DoubleStandards.org) that allows you to select an item from a drop-down list of military hardware and calculate what the money spent on that item could have bought instead had it been spent on humanitarian needs. For example, did you know that for the cost of one single B-2 Stealth Bomber, we could have instead bought a meal for 2,564,102,564 starving people, or restored eyesight to 31,446,541 people blinded by cataracts, or built homes for 713,318 families living in substandard housing? Or that the $1,800,000 we spend on one Tomahawk Cruise Missile could be used instead to build and furnish 426 schools, or to drill 2,071 wells for communities that currently have no access to clean water? The money spent just on a single SA-80 rifle could finance four adult literacy classes or supply 62 children with school books for a year, transforming all their lives through access to education. (We could even start with my children's struggling public school right here in Maryland). I can't even imagine how much good you could do with the hundreds of billions of dollars that we are sinking into our Star Wars research, all to develop a missile defense shield that doesn't work and that the latest Russian long-range missile technology might well have already rendered preemptively obsolete. It's very humbling (and very depressing) to have it spelled out in black-and-white just how dramatically we could improve the quality of life for billions of people on this planet if we were to spend our unprecedented wealth on meeting the basic needs of ordinary, struggling people instead of on the business of war. It makes you think that we must all have gone collectively insane. The problem, of course, is that the people who decide that our money will be spent on Stealth Bombers and Tomahawk Cruise Missiles are people who have never known - and cannot possibly imagine - what it is like to be hungry or homeless, or to know that the water you are drinking might well kill you, or to be left blind because you can't afford simple corrective surgery to remove a cataract. 1. The title is taken from a comment made by Reichsmarschall Hermann Goering: "Guns will make us powerful; butter will only make us fat". 2. 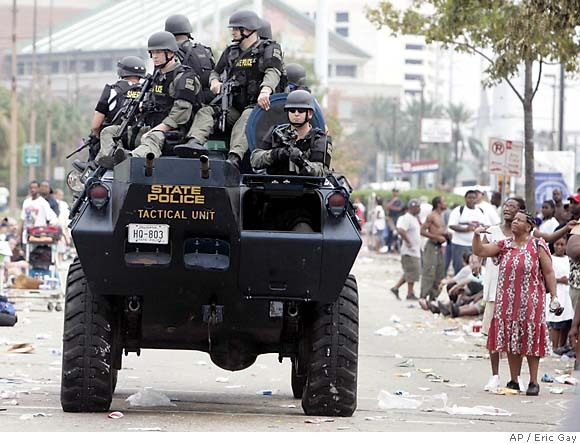 The photograph of a Louisiana State Police SWAT team patrolling New Orleans in the aftermath of Hurricane Katrina is by Eric Gay for Associated Press. Because it's not "just" about Ethiopian children with pot bellies: I bet you could strengthen an awful lot of levees on the Mississippi for the cost of an F-16 fighter too.